Made in the USA. Satisfaction Guarantee! Measure upper neck snugly behind the head. Small/Medium 20-60 pounds, up to 14” neck; Corgi, Border Collie, small Retrievers, etc. 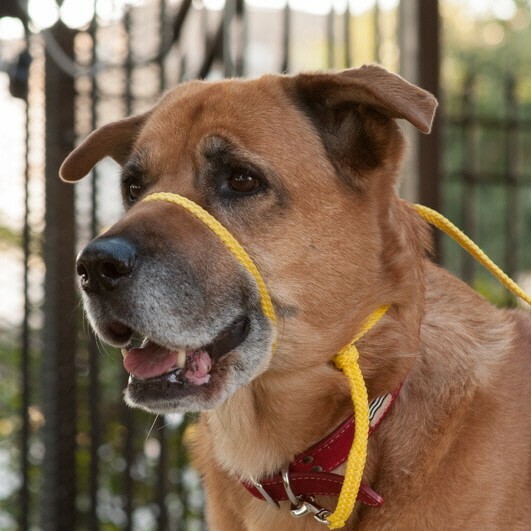 For dog 20-60 pounds, there may be more slack between the dog and the leash snap. Large 60-100 pounds, up to 18” neck; Shepherds, Rottweilers, most Retrievers, etc. X-Large 100-140 pounds, up to 22” neck; Danes, Mastiffs, etc. If in doubt, size up. If your dog has a really long head, consider the next size up. 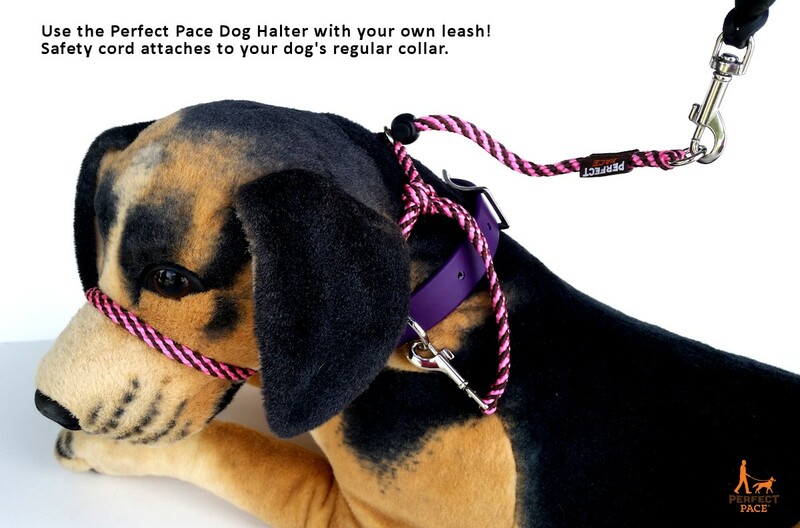 There will be at least several inches of slack between your dog’s head and the leash snap. *NOT for dogs under 20 lbs, dogs with short/flat muzzles, or breathing problems, such as pugs, bulldogs, and boxers. Leather is sturdier and more durable! Our flexible leather is the best quality you’ll find anywhere. The edges are beveled for a smooth feel. Small/medium and large sizes come in 3/8″ width leather. Large and XL sizes come in WIDE 1/2″ width leather. 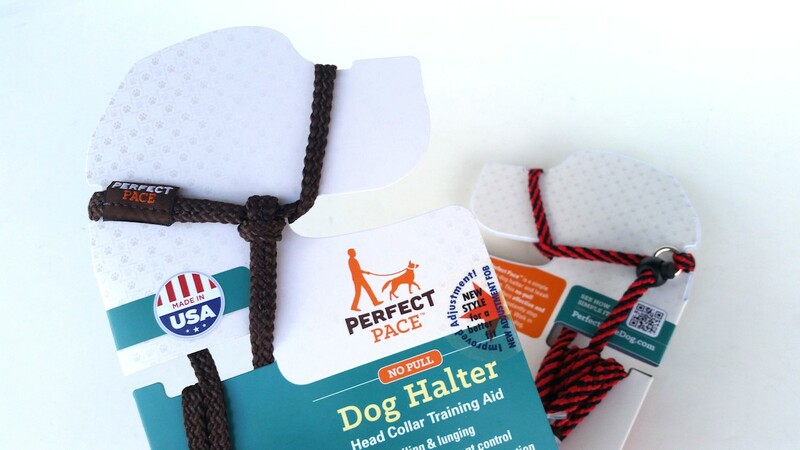 How the Perfect Pace Works: When your dog pulls pressure is applied gently behind the head and under the jaw: these pressure points are calming for your dog, encouraging focus. 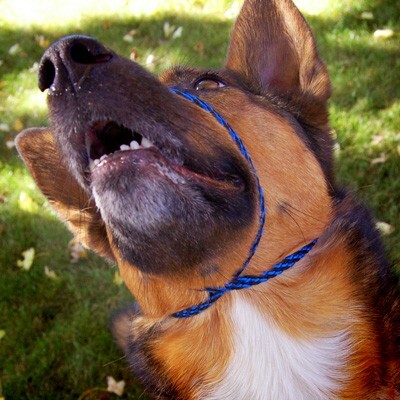 The upward pressure raises your dog’s head and reminds him to pay attention to you with less resistance. It Works Differently: Dogs that have struggled with other collars, halters, or harnesses often accept the Perfect Pace willingly and respond with calm focus and attention. If other training tools have not been right for your dog, try this one and we’ll stand behind it with our Satisfaction Guarantee. Should your dog find this training tool aversive or you are otherwise dissatisfied, return it for your money back. See our guarantee page for details. Made in USA: Product is designed and handcrafted in the USA. The package is designed, printed, and assembled in Colorado. Woven material and tan leather are also American made! A shorter, lightweight leash is recommended. My puppy is easily distracted and a strong puller so walks are not chill experiences. 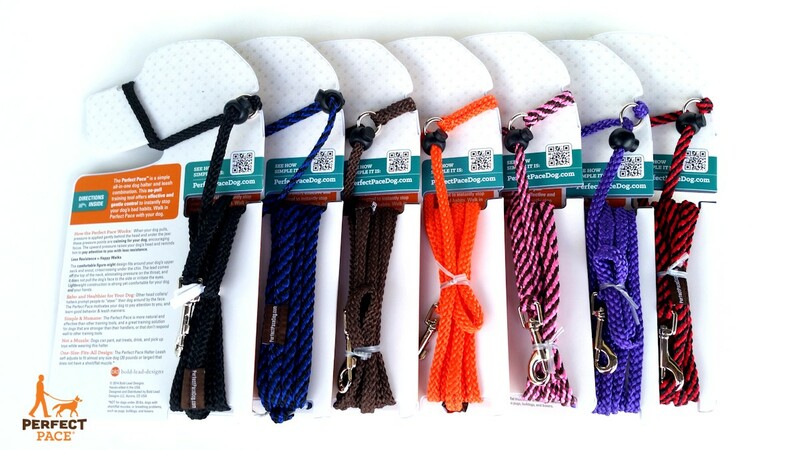 We’ve tried a martingale collar, a front attachment harness, and now a variety of head collars. Of the three we’ve tried, the Perfect Pace is the unrivaled winner. It’s lightweight, simple construction doesn’t bother her too much. She’ll lightly fuss with it, but it’s not all the time or to the intensity she rebelled against the Gentle Leader or Sporn head halter. She was so unhappy with them that she’d throw herself on the ground and paw at her face when she’d walk. The Perfect Pace is a major relief. Walks are enjoyable for both parties and we avoid using a prong collar. The only issue we have is that the leather adjustment fob is very hard to move. It takes a lot of effort and time to either secure or remove the collar. This will loosen with more use though so I’m willing to deal with it. This lead works. I’ve tried everything with my dogs. Nothing has worked so instantly with them. It’s comfortable, they get used to it quickly. I have 4 dogs and it’s easy to change the size quickly depending on which dog I’m walking. This has made the difference from not taking them out in public, to walks every evening and weekend. I purchased this when a trainer recommended my very anxious pulling (and squirrel chasing) dog would do better with a head halter. I had two other head halters, one chafed her muzzle by her eyes quite badly and the other broke in less than a month. This is beautifully simple! She walks well on it, and she doesn’t rub her face trying to remove it. 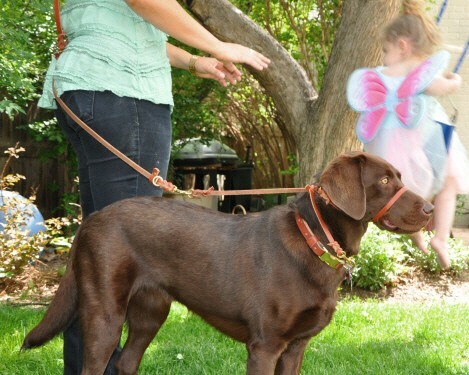 I also like that she can easily walk on either side without my having to switch the side the lead is on. And, as someone who really tries to buy made in the USA whenever possible, I really appreciate that I can buy this in good conscience. I will be buying more from this company. Thank you! I adore this gentle lead collar. I have a pitbull puppy who is reactive to other dogs (to play, not hurt) and she’s so strong that with a regular collar (even a martingale) and leash she pulls me and we do not have enjoyable walks. This changed everything for both of us!! Highly recommend it. I’m buying one for a friend now!! Great job and thank you for having this!!! I have the leather head halter. My first service dog hated every head halter until this one (the others kept scratching his face or he could break out of it). The material is buttery soft (and we worked mink oil into it to make it even softer), beautifully crafted. I will never buy any other head halter ever again, but I am sure this one will last me for years! I bought two halters when it was still called the infinity lead and we still use it! My GSD has come leaps and bounds in our training and my Great Dane now walks like a perfect gentleman. I have recommended it to many people in my social group. We chose the cloth version and it has stood up to many months of daily use. Can’t wait to buy from BLD again. Perfect for keeping my Whippet safe and controlled while waiting for her run on the coursing field.. Brilliant colours….practical and easy to put on..!!! This halter has been a huge help in teaching my service dog (still an older puppy) to ignore other dogs and to pay more attention to me. I wish I had used it from the start. I got the braided halter to start with; may eventually go to the leather model. The braided one is well-made, and Bold Lead’s customer service was extremely helpful telling me what I needed to know to make a good decision between the two. They also offered to give me some training as to how to use it on my dog, which I encourage anyone to accept. I’ve tried many different types of head collar to help me with my over-stimulated Border Collie but this is the last one I had to buy. I was intrigued by the design and the positive reactions of other people buying Bold Lead Designs products. Checking the products out I was pleased to see they would deliver to the UK without wanting to charge a stupid price for postage. So I went ahead. That was 3 years ago. What a great lead it is – I have the woven one in brown as I have a sable and white dog the lead doesn’t stand out on him. It’s easy to put on and I’m not known for my dexterity! The lead sits on his nose nicely and doesn’t ride up into his eyes as other brands have done. He also doesn’t try to scrape it off all the time like previous halters and it doesn’t dig in to his nose. I’m very pleased I bought this all-in-one lead, I feel more confident walking him and he’s far more controllable with this on. It really does what it says on the description! I love how simple and elegant this lead is. My lab will pull like a truck when walked without this, but as soon as I put it on she is calm and goes into ‘work’ mode. It’s lovely for walking through busy places. I get lots of people asking where they can get one from as they’ve never seen anything like this. We’ve had the Perfect Pace for three months now, so we do have some experience with it. Our dog is a one year old mini Australian Shepherd, 28 pounds. We find this lead difficult to put on as Bae tends to fight it. Once it is on, he still tends to pull, but not as much as a regular choke chain. If you let it relax just a little, it will slip off his nose. So three stars is all we can rate it. Was the perfect lead I was needing for big Lola. it doesn’t mush her eyes and she doesn’t even know its on.. Thank you for all your help with her harness and now the perfect lead. Makes my life so much more comfortable as well as my big Lola. I just wanted to thank you. 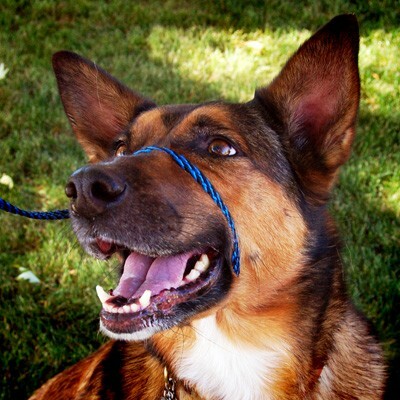 I have a dominant breed and struggled for years to have a pleasant walking experience with him. I’ve used face harnesses before, but they were always uncomfortable for him with his short nose, not to mention they put pressure on his face rather than the back of his neck – also seems to be uncomfortable. His face harness broke and I decided to search the Internet for something more effective. I got this product in three days, and had the best walk we’ve had in three years. He understood the concept almost immediately and didn’t seem to be bothered by the material as it is soft. Thanks again for such an amazing product, and I will be sure to spread the word!! The Perfect Pace is the new brand name for the former INFINITY LEAD. Please note some reviews reference the old name, but the product is the same! 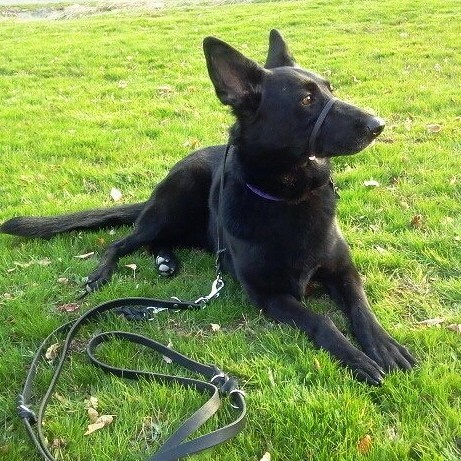 I just wanted to tell you that I received my fabulous beautiful, exactly what I wanted, training lead this evening couldn’t wait to tell you how happy I am with it. I rescued an “8 month old” standard poodle that turned out to be 14 months old with a 3 month old puppy brain and no training. Needless to say, he is a major “work in progress.” It’s been about 30 years since I trained any dogs, so to say that everything I knew then and products that I liked from before, and that I can now find, has drastically changed. Your lead is the fourth — and last – one that I will have to purchase, as it is EXACTLY what I wanted, functional and soft. I am just so thrilled with it that I had to write and let you know how much I appreciate what you do. I’m sure Teddy will appreciate it as much as I do, can’t wait to get him out with it and work with him. My assist puppy isn’t able to use this yet, but it’s brilliant! . . . It annoys me that halti’s require sharp/sudden moves for redirection, the infinity lead makes it harder for the dog’s mind to wander for some reason! WOW! We just got the lead in the mail and what a HUGE difference it makes. 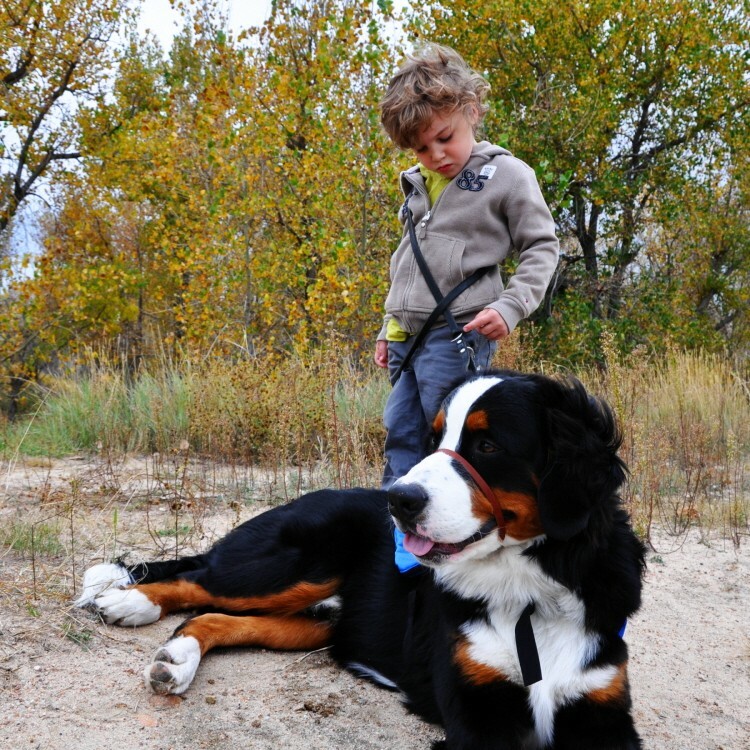 We can walk our Greater Swiss Mountain Dog with out worrying we will be eating pavement! She’s only 6 months old and VERY strong so only my husband could walk her. That’s not practical so we bought the 4 foot lead and attached it to her 6 foot lead for road walks and a longer lead for forest and trail walking. Now my 100 pound daughter can handle her. AMAZING. After a minute or so of semi protest, Dany took to it like a duck to water. Now she really enjoys walks as this calms her down immediately and I can’t tell you how it makes US feel! I am going to recommend this to all my pals who have pullers and my dog trainer too. Thank you so much for such an excellent product that does exactly what it says it will. I’ve purchased multiple Infinity collar/lead combos from you and been amazed at how much control they give me. I admit I was concerned with how thin the lead looked but after seeing how well the collar performs I now see why it doesn’t NEED to be any thicker. I can walk my Bully breed with 1 finger if I need to! I’ve been raving about the Infinity products at my agility club, veterinarian’s, behaviorist, etc. Bought two of these for my dogs and we love them! My smaller dog no longer fights having a head collar on and my large dog, a hound, I don’t find myself fighting as much. I’ve gotten a lot of compliments from friends and family who are interested in the design, that it doesn’t smush their eyes and that it is light weight. Very happy! At my Veterinary Hospital I am the Animal Behavior Technician. . . . I absolutely love the concept and design. I teach puppy and adult classes as well as problem solving class such as loose leash walking. 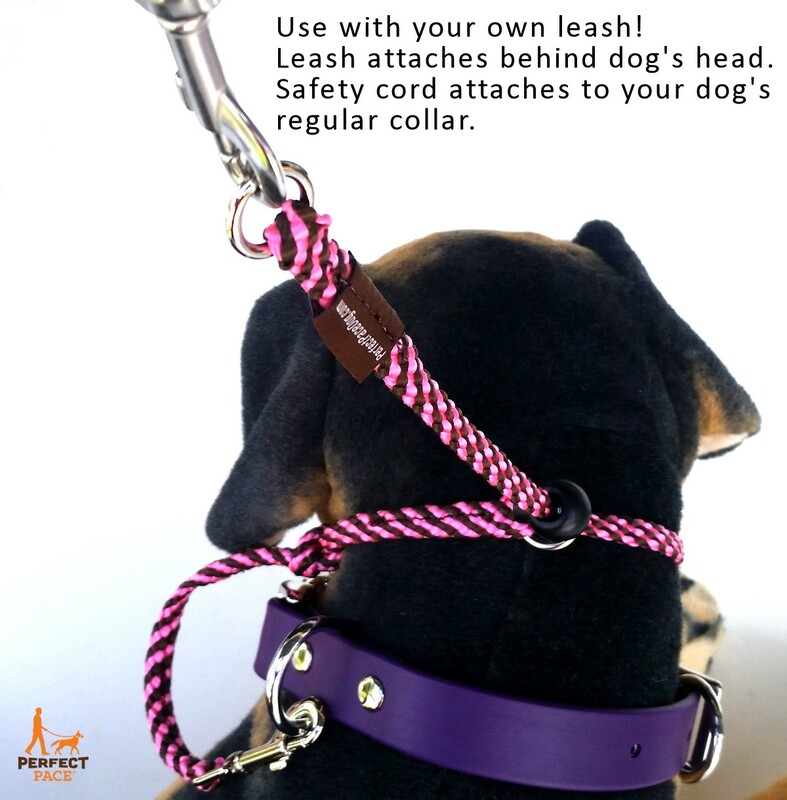 I have already been suggesting this leash/head collar as a great training tool but having a few cards or brochures to hand out would be great too. I purchased the infinity lead through our trainer and love it! I recently lost it in a move and tried walking on a regular leash again, not there yet! I am excited to find your website and purchase another, I cant wait to get back to smooth walks again! 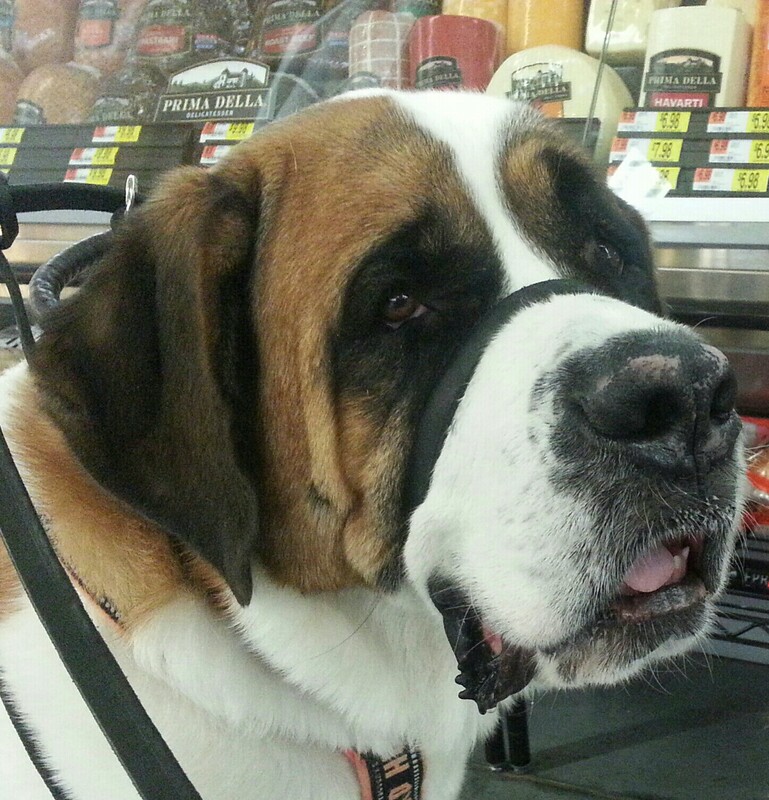 I love your product, we had tried the gentle leader before this one and returned it. Your design is simple, easy to use and quick to put on. Thank you! Before I purchase, I would like to know who has used this on a snow breed like a husky? Hi Dawn, I’m not sure if other clients will respond, but yes, this is very effective on the northern breeds. Give it a try! We do have a satisfaction guarantee. 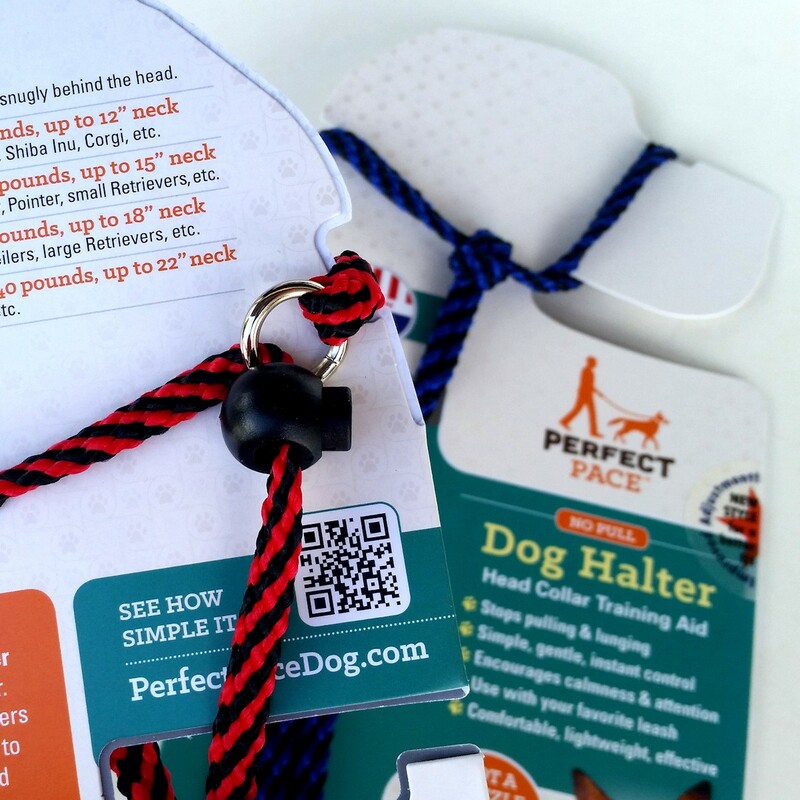 A Head Harness You Won’t Hate! 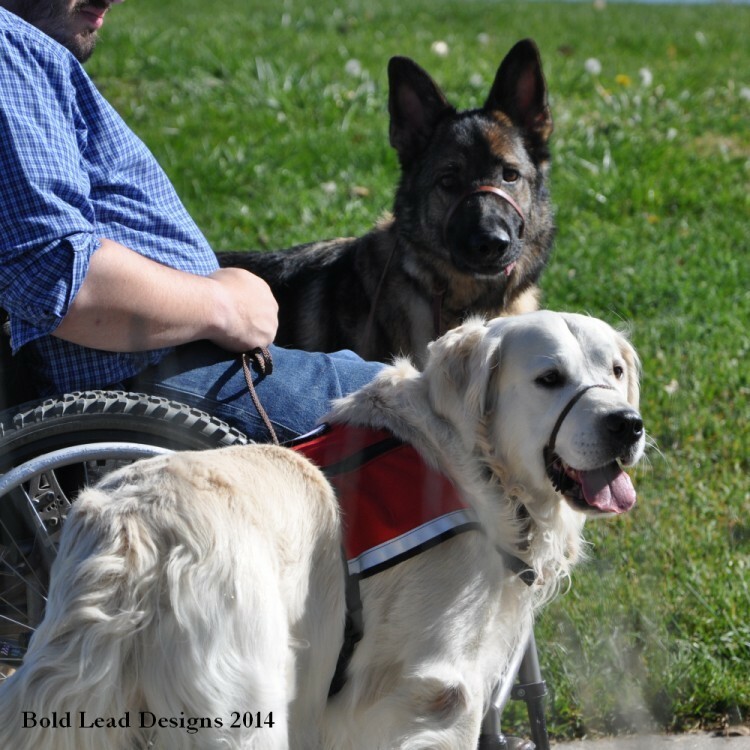 I purchased the BLD Infinity Lead Halter and Lead combo for my mobility service dog in training. Malcolm is learning quickly but still likes to use his nose and sniff more than is appropriate when he’s working and training out in public places. With the Infinity Lead, I can gently and easily remind him to stay focused on his mobility work. The Infinity Lead is narrow and lightweight. Malcolm adjusted to wearing it with virtually no difficulty. He pawed at it once or twice and then wore it like he’s worn it all his life. It fits and folds easily into my hand in a very comfortable way. The only “negative” I’ve found with this product, and it’s VERY minor, is that because of how it adjusts it’s difficult to adjust the fit exactly the same each time. We’re both grateful to have found such a comfortable and affordable solution for his service dog working and training needs. Like many people I am always looking for ways to increase communication between me and my dog. 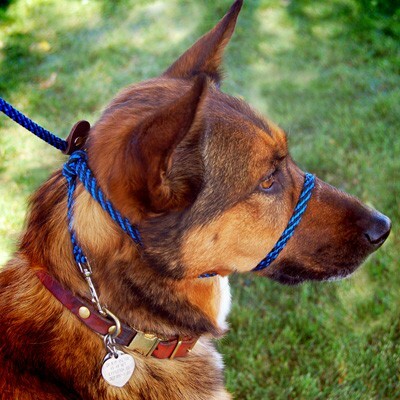 I’ve tried many other traditional head halters and found that it irritated my dog due to the accidental corrections he would receive from the weight of the leash clip dangling and swinging as we walked. Over time Billy got less and less willing to work and move forward in the head halter. Then I got this wonderful leash. Billy took to it right away with no real period of adjustment. I just put it on him, adjusted it and away we went. He doesn’t paw at it and once again moves forward willing and is even happy to go to work when he sees it. 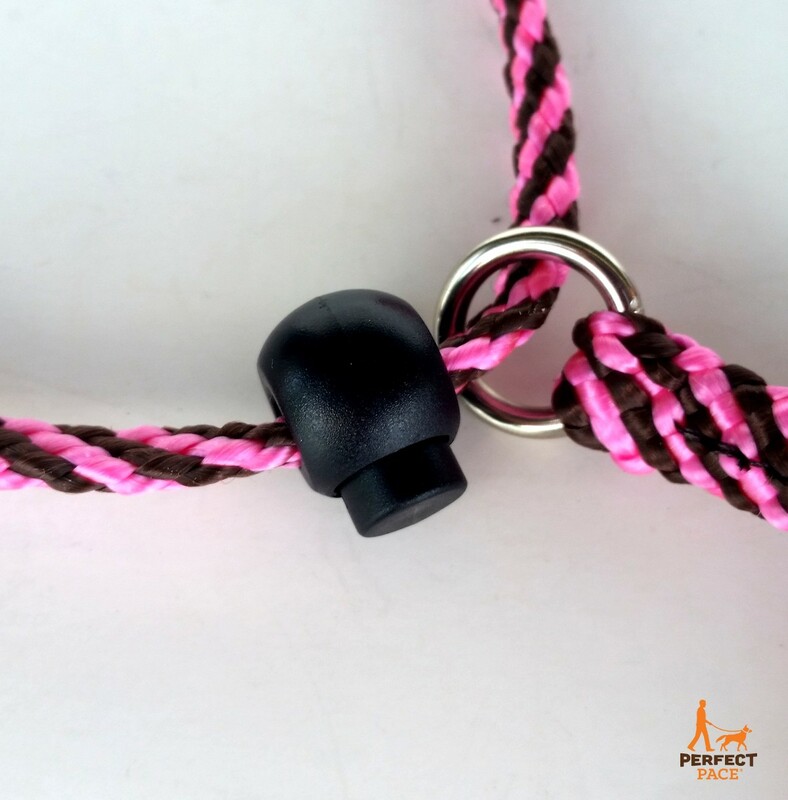 We absolutely love this leash and the length is perfect if you are working your dog in harness for balance/mobility like I do. The feed back I get from the infinity lead is absolutely amazing, I can feel where Billy’s attention is and he can tell where I want him to go even before I cue him to turn left or right. This will always be a part of our working gear. Our dog Molly has pulled and tugged since we got her as a puppy! We took her to training classes, tried 2 different harnesses and 3 gentle leaders, and nothing worked. She is a stocky lab and is very strong now that she’s no longer a pup. I have sprained my ankle 3 times walking her due to being thrown off balance by her tugging! Anyway, my sister in law was visiting us and had this lead with her and I borrowed it to walk Molly and was amazed. I ordered one as soon as they left and I love it! It has made our walks so much more enjoyable and not something I totally dread. I think I will order another one for my other dog Sampson, not necessarily because he’s a tugger, but he’s 140lbs, and just because it’s a great lead! The Infinity Lead is by far the best head collar out there. So lightweight the dog barely notices it’s there, and just the lightest touch provides feedback that makes communicating with my assistance dog a dream. I highly recommend it!